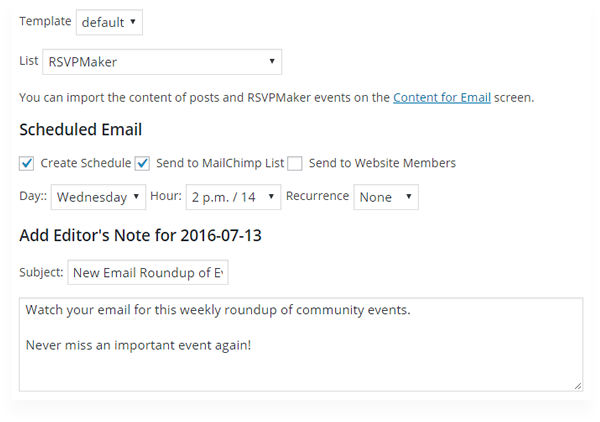 You can now use RSVPMaker to send email invitations to events, as well as other messages relevant to the community you have built around your website. If you want to send messages to a large list, you can use RSVPMaker’s integration with the MailChimp broadcast email service. Independently, RSVPMaker will allow you to send messages to members of your website (for community-based sites that provide user accounts to members), to people who have signed up for an event, or to past attendees at events. In addition to sending single messages, you can schedule a newsletter such as a roundup of upcoming events and recent blog posts to be sent out on a daily or weekly basis. The new options appear on the RSVP Mailer menu, immediately below RSVP Events. By default, the ability to create and send messages is restricted to the administrator only, although you can grant permission other user types on the settings screen. 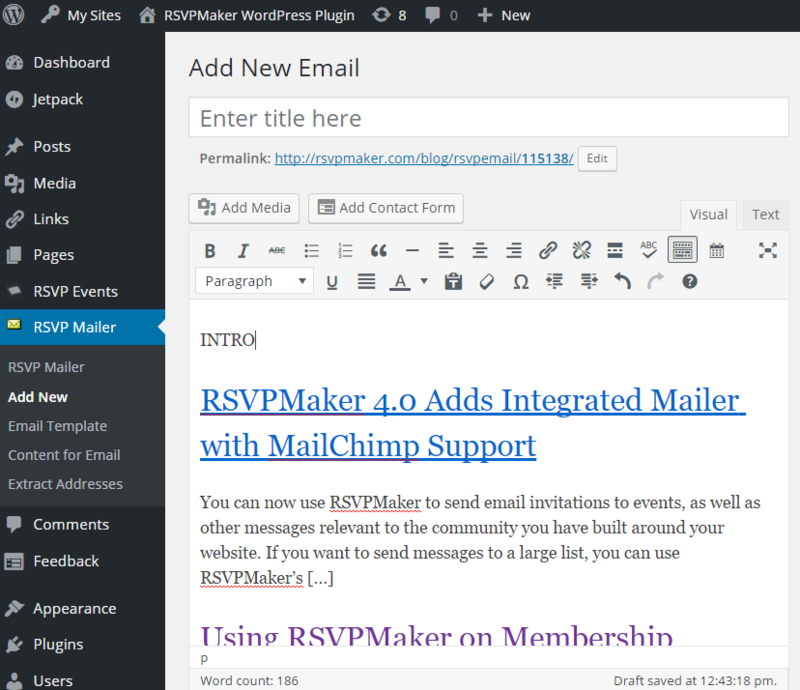 RSVPMaker has actually included features designed to work with MailChimp for years, such as encoding on the RSVP Now! button that is replaced with the recipient’s email address when a message is sent. Previously, I provided support for sending MailChimp emails through a separate plugin, ChimpBlast, which I made great use of but few others seemed to appreciate. 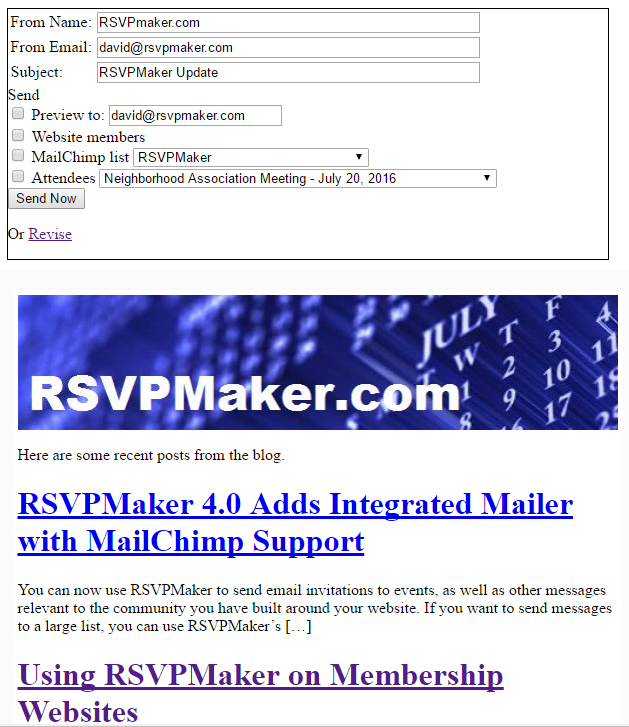 The RSVP Mailer feature of RSVPMaker is a new, improved version of that functionality. It’s also been updated for version 3.0 of the MailChimp API (with the help of a PHP class wrapper by Drew McLellan – thank you! ), whereas ChimpBlast was several versions behind. While ChimpBlast was lagging, RSVPMaker itself had added several email-related features related to confirmation messages and reminders. I have also been hearing from more people who run membership websites who would like to be able to email the members of their organization without necessarily relying on a service such as MailChimp. So adding a more full-fledged mailer only made sense. 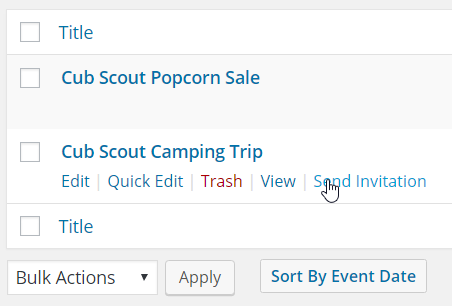 You can create an event invitation from the RSVP Events screen by selecting “Send Invitation” from the menu that appears when you hover your event over the title. Alternatively, you can pick an event from the “Content for Email” screen. Imported content will be loaded into the editor, with a placeholder for an introductory message you can add. Other options include importing the headline and excerpt / content from a recent blog post to serve as the basis for an email broadcast. Or you can import a listing of recent posts. 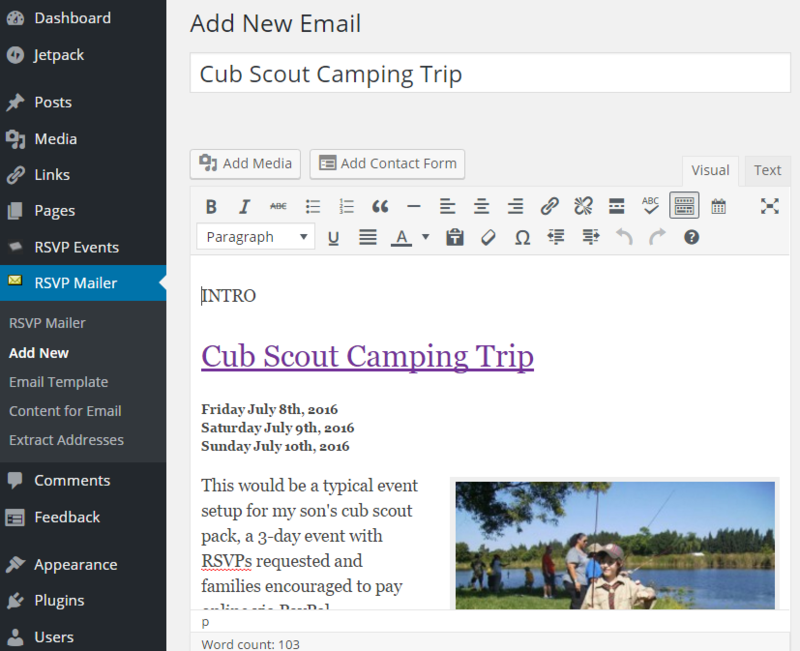 Editing an email roundup of recent blog posts. Once you have edited your email draft to your liking, you can preview it on the website and send it to a MailChimp list, user list, or attendee list. The controls for sending messages only appear when this page is viewed by a user authorized to send messages. Previewing and approving messages on the website. To create an email newsletter that works with the RSVP Mailer, I would use a series of shortcodes. 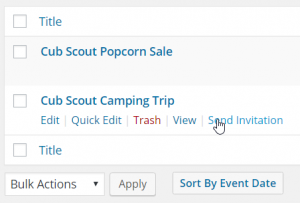 Of these, rsvpmaker_upcoming is the familiar tag used to display a calendar and events listing on your website, and you can use the popup editor to modify the settings. Two additions are rsvpmaker_recent_blog_posts, which will display blog posts from the past week (if there are any) and rsvpmaker_looking_ahead, which displays linked headlines of events beyond the period covered in the full events listing. The options for setting a schedule for distribution of a newsletter or other scheduled broadcast are at the bottom of the RSVP Mailer editing screen. Once you have turned on this feature and specified which list you want to send to, you will also be given the opportunity to add an Editor’s Note for a specific edition of the newsletter. This is a good way to call attention to a specific event, or a specific blog post, or to add a personal message. 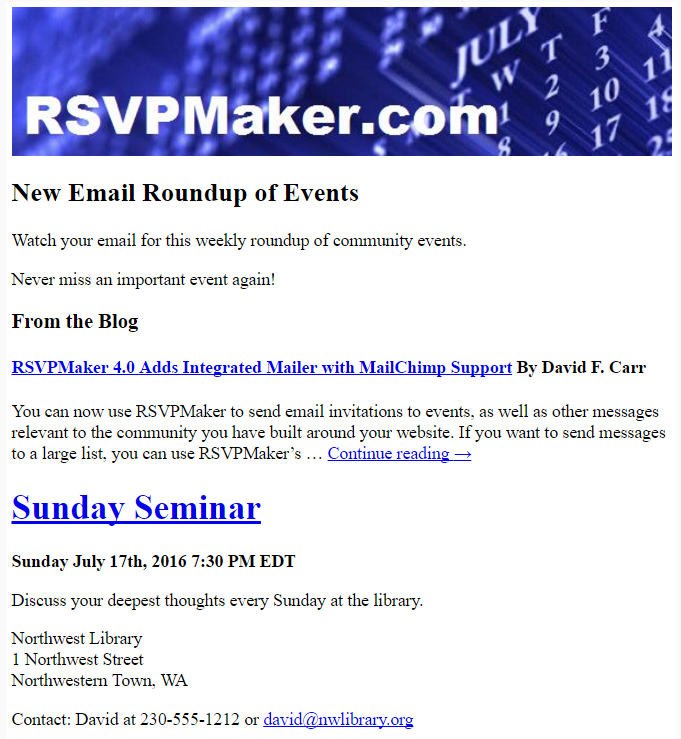 A sample newsletter driven by RSVPMaker. The Email Template screen is where you can set options such as the background color to be used with your emails and CSS parameters for HTML tags and classes. These will be added inline to your HTML content when the message is generated, since email clients don’t otherwise reliably process stylesheets in the head of a document.